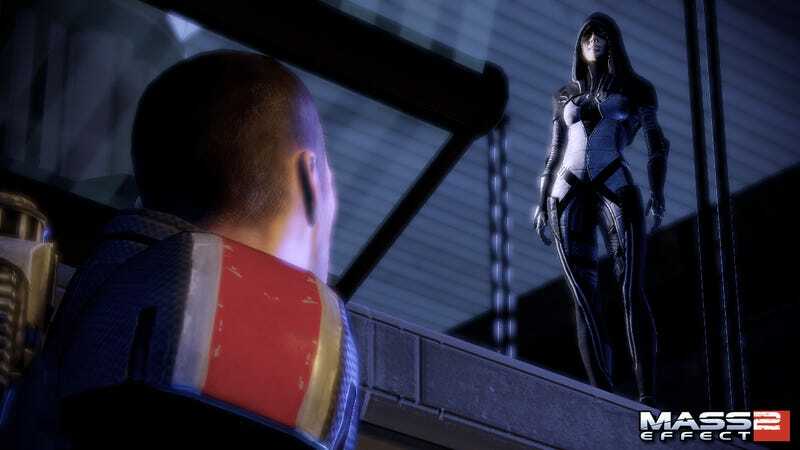 In San Francisco, where thousands of game creators are swarming the 2010 Game Developers' Conference, BioWare's Casey Hudson was showing his Mass Effect 2's first paid expansion, Kasumi's Stolen Memory. It features a new potential ally, the 12th for the sequel, the elite thief Kasumi. This DLC is Mass Effect's ode to James Bond. It is an undercover slip into a formal-attire-required party at the estate of the shady Donovan Hock, mixed with a bit of schmoozing, a safe that needs cracking and then gunfire. There is a vault in this 90-minute level. It contains statues of familiar characters and two of the most popular statues from Earth: Michelangelo's David and the Statue of Liberty. That's a tease, Hudson told Kotaku, of what has happened to Earth in the Mass Effect fiction, though we're not going there in this DLC. "At some point we will go to the Earth," he said. When? He's not saying. The Kasumi DLC offers this one Bond-style mission and a number of frills. Players will wind up with a new weapon (submachine gun), a new power (the ability to throw flashbang grenades), one Achievement and a new unlocked area of the player's spaceship. Kasumi will hang out in that new area of the ship and will also be able to stick with you through the game. Her special ability, a Shade Strike that sends her, cloaked in invisibility, on a dash toward the enemy to perform a powerful attack, could prove handy. She will interact with the other Mass Effect 2 characters, according to Hudson. Hudson described Kasumi's Stolen Memory as the first of a series of paid downloadable content offerings for Mass Effect 2. While this new one doesn't tweak the game's engine he said that it is already enabling BioWare's developers to try new art tricks and styles. He said that other DLC Mass Effect 2 projects are underway. They may very in length of quest and type of content, but they're coming. Kasumi's Stolen Memory will be out next month for Xbox 360 and PC. No price given. Players will be able to access it once they have played enough of Mass Effect 2 to attain their own in-game space-ship and/or after the end of the game's main quest.